John C. Portman, an architect and developer known for his post-modernist designs that helped reshaped cities such as Atlanta and New York, has died. He was 93. Portman’s revolutionary designs redefined urban landscapes, though sometimes not without controversy. The New York Times reported that some of his buildings were criticized as concrete islands and self-contained cities within cities. 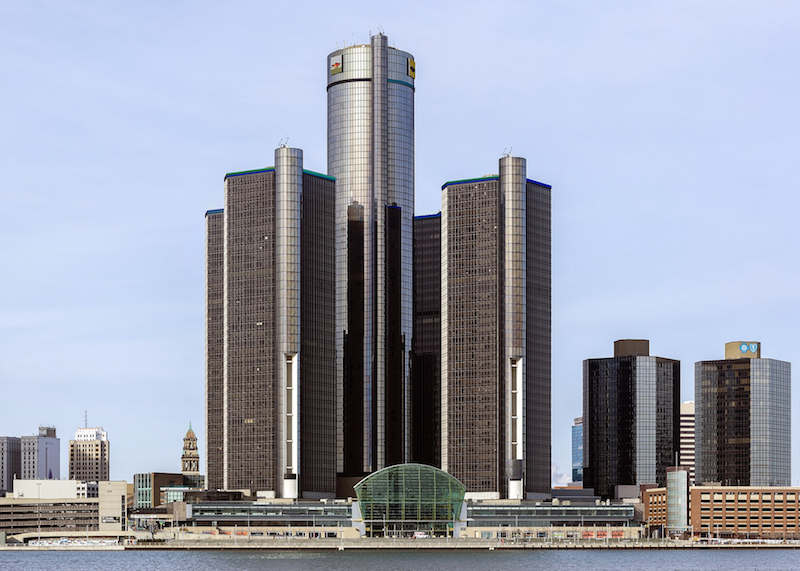 The Renaissance Center in Detroit is one of the best known Portman designs. Photo by Crisco 1492 via Wikimedia Commons (2014). The Atlanta Journal-Constitution report ed that no single architect shaped Atlanta’s skyline like Portman. He gave the city the cylindrical Westin Peachtree Plaza hotel as well as the AmericasMart, an array of buildings downtown where wholesale goods are bought and sold. The newspaper said Portman died Friday. He also left his mark from San Francisco to Shanghai, and helped revitalize Times Square with his famed New York Marriott Marquis. Atlanta Mayor Kasim Reed said few people had shaped the city as much as Portman.